A team of researchers working on the antiProton Unstable Matter Annihilation (PUMA) project near CERN's particle laboratory, according to a report in Nature, plans to capture a billion antiprotons, put them in a shipping container and transfer them to a lab that is conducting experiments collectively called ISOLDE. 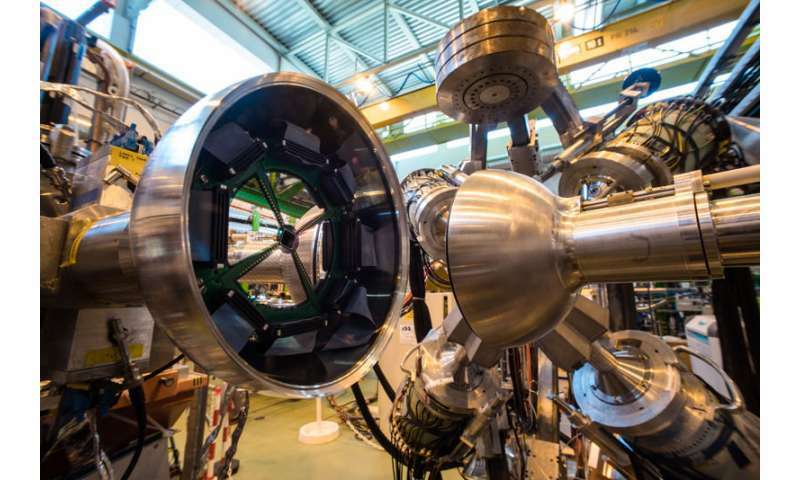 The antiprotons will be created the same way that they are currently made at what has become known as CERN's antimatter factory, but they will be used in experiments in a nearby building. For that to happen, the antiprotons will have to be boxed up and shipped in a van. Antiprotons are, of course, the opposite twins of protons—they exist sometimes in nature, but do not last long, because when they come into contact with regular matter, they are annihilated. Researchers at CERN create them by firing a proton beam at a metal target—holding antiprotons in a vacuum chamber at just 4 degrees above absolute zero, comparable to intergalactic space, can protect them from annihilation for brief periods. The PUMA team are trying to learn more about the nuclei of large radioactive atoms, and to that end, want to fire antiprotons at them and then study the remnants after both are annihilated. But for that to happen, the team has to develop a means for transporting the antiprotons from the site where they are created to the site where they will be tested—from one lab to another just a few hundred meters away. The plan is to create a trap capable of holding a billion antiprotons for up to a week. The team estimates it is likely to take up to four years to get the trap just right. In addition to providing the workers at ISOLDE with a batch of antiprotons, the project will also establish a technique for other teams working at much greater distances. That will give researchers from perhaps all over the world access to antiproton batches for use in their own experiments. Oh my yes! i can hardly wait for the video on U-Tube. When a traffic cop pulls the van over for, say, driving under the influence of lascivious carriage? The expression on the officer's face. Getting all twitchy as the driver of the van tries to explain why it would be a bad idea to open the crate in the back. Amid the SNAFU kludgefest traffic of Geneva and the border. le plus amusant, j'en suis sûr! "Running around robbing banks All wacked off of Scooby Snacks!..." How about more research into the ultra cold so large quantities of anti matter could be stored a'la Star Trek. Better yet, look into instant production of large quantitiese of this matter for rocket propulsion, earth to space an back. This research has implications for matter/anti-matter energy far into the future even after we achieve fusion. How about more research into the ultra cold so large quantities of anti matter could be stored a'la Star Trek. b) Creating antimatter like the above (and storing it) takes vastly, vastly, VASTLY more energy than you get back when you annihilate it. According to my calculations, annihilating a billion antiprotons with a billion protons would create about 0.300 Joules. Virtually undetectable!